Trainer Gary Portelli is hoping his two fillies Secret Lady and Perfect Pitch can dim the chances of the odds on favourite Sunlight in the Group 3 $175,000 Canadian Club Magic Night Stakes (1200m) at Rosehill today. Secret Lady, above, is at long odds to beat Sunlight in the Magic Night Stakes at Rosehill. Photo by Steve Hart. But Portelli knows his two fillies will be facing a huge task taking on the Golden Slipper Stakes favourite Sunlight who he said is one of the fastest horses he had clocked at Warwick Farm. 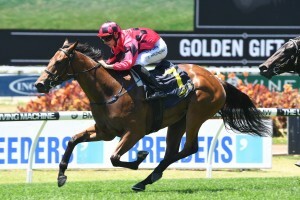 “Sunlight is one of the fastest I’ve ever clocked at Warwick Farm, she is a machine,’’ Portelli told The Daily Telegraph. Sunlight is the $1.40 favourite for the Magic Night Stakes while Secret Lady at $26 and Perfect Pitch at $34 are at long odds to beat the Tony McEvoy trained filly. Secret Lady is currently number eighteen in the order of entry for the Group 1 $3.5m Longines Golden Slipper Stakes (1200m) at Rosehill next Saturday while Perfect Pitch is number thirty-four and both fillies must win the Magic Night Stakes to grab a spot in the final field of sixteen. Secret Lady is coming off a last start seventh to Fiesta in the Group 3 $150,000 Widden Stakes (1100m) at Rosehill on February 3 but Portelli said the filly had a tough run and he said he is willing to forget that run. “Secret Lady’s last run was a dot ball,’’ Portelli said. “She was four-deep the journey and battled on as good as she could. She has drawn well, has had a freshen up and if she can place it means she gets some black type which means a lot, and that should be enough to get her into the Slipper next week.